A pair of rapid-fire strikes from the school’s all-time leading goal-scorer relatively early in the first period and continued strong play between the pipes from the formerly out-of-favor sophomore netminder thereafter propelled the visiting PENN STATE NITTANY LIONS to a most sensational 4-1 triumph over the # 4 ranked UNIVERSITY of MASSASCHUSETTS – LOWELL RIVER HAWKS and a highly deserved split of this surprising NCAA non-conference weekend series in New England. The River Hawks have been definitely rotating goaltenders to start this 2014/15 campaign but the conspicuous fact that UMass/Lowell made three other changes to its line-up from Friday night’s match was, perhaps, an indication that the home side who came into the weekend series as the highest scoring team in all the land were feeling a tad overconfident for the Saturday night date with Penn State, still, of course, only just beginning their third-ever season as a Division I ice hockey program. Penn State came out skating hard and, as usual, ready to have a shot at goal from any angle whatsoever. The Nittany Lions were then presented with an early power play opportunity and took full advantage soon enough. Casey Bailey, the 22-year-old junior right wing from Anchorage, Alaska, who has been in lethal form this fall, wristed a long shot from the top of the right circle past Canadian legionnaire Jeff Smith, the 19-year-old freshman from Maple Ridge, British Columbia, immediately after a faceoff in the UMass/Lowell zone. Penn State doubled its lead less than two minutes later when Bailey was left all alone in the slot. Nittany Lions center Taylor Holstrom, the 24-year-old redshirt senior from Yorba Linda, California, quickly sent a radar-like pass from behind the goal line and Bailey one-time the puck into the River Hawks net with a great deal of authority to score his second of the night and his team-leading eighth goal of this season. 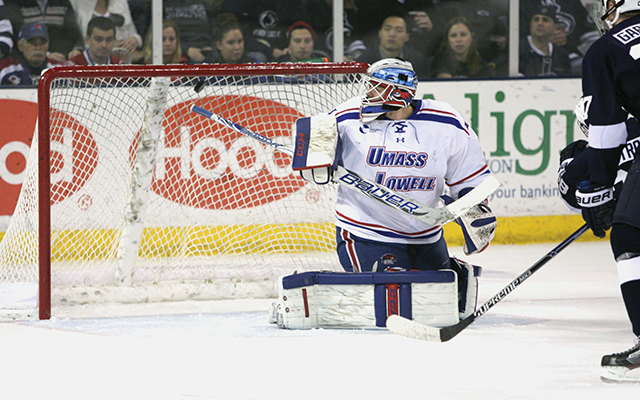 UMass/Lowell were completely stunned, as was most of the audience at the Paul E. Tsongas Center. The River Hawks made several attempts in the opening twenty minutes to put themselves on the comeback trail but would find the path blocked by Penn State goaltender Eamon McAdam. The 20-year-old homegrown sophomore from Perkasie who was the third round selection (# 70 overall) of the New York Islanders at the 2013 National Hockey League Draft picked right up where he left off after coming off the bench for the Nittany Lions in Friday night’s contest and showed why NHL scouts had thought so highly of him in the first place. McAdam suffered through a freshman term (10 ga, 4.09 avg, .882 svpct), to review, and not appeared for Penn State since early of February of last season but showed he is ready to leave all that in the rear view mirror. Penn State Nittany Lions goaltender Eamon McAdam (34) made ten starts as a freshman last term but posted the dubious record of zero wins against nine losses and had to sit out 21 consecutive NCAA contests before coming on in relief during Friday night’s game against the UMass/Lowell River Hawks. The Nittany Lions added a third goal with only nineteen second left in the opening period to further dampen the spirits of the nation’s # 4 ranked ice hockey team. After continuous pressure in the UMass/Lowell zone, defenseman David Thompson, the 22-year-old homegrown sophomore from Glens Mills who missed five games this fall after being injured at the 2014 Brice Alaska Goal Rush tournament in Fairbanks, sent a shot from the right point in on net and right wing Eric Scheid was able to sweep the puck home on the backhand. It was the sixth goal of this season for Scheid, the 22-year-old redshirt junior from Blaine, Minnesota, who led Penn State with both 11 goals and 20 points in 36 NCAA games last season after transferring from the University of Alaska – Anchorage. The visitors probably broke the River Hawks back by scoring yet again just 47 seconds into the second period. Right wing Tommy Olczyk, the 23-year-old senior from Long Grove, Illinois, who also scored in Friday night’s contest after sitting out four games in a row, sped down the right wing on a two-on-one before calmly slotting the puck home on a left-handed wrist shot. Assisting on Olczyk’s third goal of this season was none other than the influential Holstrom, who earned his third assist of the evening in the process. Thereafter, the focus shifted onto McAdam, who kept the high-powered offense of UMass/Lowell off the scoreboard for more than fifty minutes on Saturday night. This after the seldom-used sophomore had stopped 17 of 18 shots faced in roughly thirty-one minutes the previoius evening. In all, McAdam limited the River Hawks to just two goals while stopping 40 shots during the weekend series in New England. As for Penn State (now 6-2-2), this victory over # 4 ranked UMass/Lowell might very well rate as the greatest ice hockey result in school history thus far. Certainly, knocking off the # 18 ranked Wisconsin Badgers in Madison two years ago and beating the nine-time NCAA champion Michigan Wolverines to win the Nittany Lions’ first-ever Big Ten Conference tournament game were also spectacular accomplishments for the fledgling program. But a triumph over a Top Five team is a triumph over a Top Five team. Penn State center Taylor Holstrom (28), who is one of just a handful of players leftover from the Nittany Lions’ well-documented “club hockey” days, leads all Division I college players with 13 assists and is tied with four other skaters for top scoring honors with 16 points this season. In a rather cleanly played ice hockey game that saw both sides amass a combined total of only four penalty minutes for the duration of the contest, the home team opened up a three-goal lead midway through the second period before settling in to protect what had already been gained as the # 4 ranked UNIVERSITY of MASSACHUSETTS – LOWELL RIVER HAWKS skated to a 5-3 victory over the visiting PENN STATE NITTANY LIONS in the first of this weekend’s non-conference set. The River Hawks, who now sport seven wins and two ties from their first ten games of this 2014/15 NCAA season came, entered into this latest Big Ten Conference versus Hockey East engagement as the only Division I team in the entire country to be currently averaging more than four goals scored per contest. UMass/Lowell, who swept the Nittany Lions on the road in State College last season, demonstrated its offensive potential this term by scoring four goals on its first dozen shots of the game. 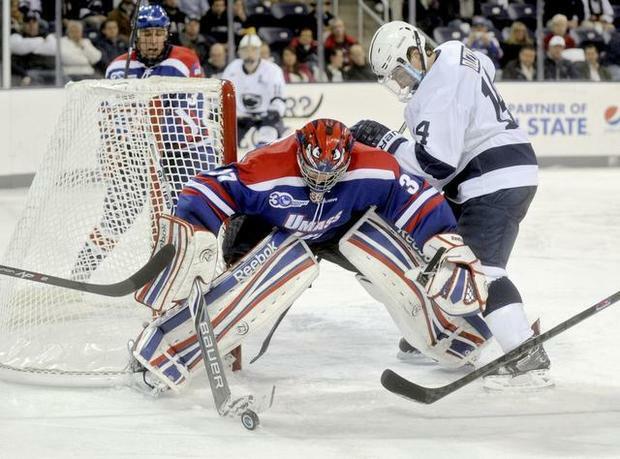 Penn State goaltender Matthew Skoff, the 22-year-old homegrown junior from McKees Rock who, on the whole, has been in good form this fall, was recalled to the bench after the River Hawks notched their fourth goal almost eight and a half minutes into the second period. Sent out onto the ice for a first appearance of this 2014/15 NCAA campaign was Eamon McAdam, the 20-year-old homegrown sophomore from Perkasie whom the New York Islanders picked in the third round (# 70 overall) of the 2013 National Hockey League Draft but struggled during what was, for the most part, a disappointing freshman season (10 ga, 4.09 avg, .882 svpct) last term. McAdam had not played since early last February (a 7-3 loss to the Michigan Wolverines) but gave a good account of himself while stopping 17 of 18 shots from UMass/Lowell in nearly thirty-one minutes of game time. The Nittany Lions halved their deficit just seventeen seconds into the middle frame when right wing Corey Bailey, the 22-year-old junior from Anchorage, Alaska, who has clearly rediscovered his old scoring touch, netted on the backhand to notch his team-leading sixth strike of the season. Penn State center Taylor Holstrom, the 24-year-old senior from Yorba Linda, California, made a tremendous play to keep the puck in the offensive zone at the right point, it should be noted. UMass/Lowell stormed straight back, however, and soon re-established its two-goal lead when the diminutive (5’8″ 175 lbs) left wing Robert Francis, the 23-year-old junior from San Diego, California, who transferred from Western Michigan University, found the back of the net for the second time on the night. Penn State pulled a couple of goals back in the third period to salvage a measure of pride and, perhaps, build some momentum for Saturday evening’s return encounter with the River Hawks. Tommy Olczyk, the 23-year-old senior right wing from Long Grove, Illinois, who had been out of the line-up for the Nittany Lions’ last four games, celebrated his return by scoring on the backhand after a nice pass from behind the net by Canadian legionnaire Curtis Loik, the 21-year-old junior left wing from West Vancouver, British Columbia. And David Goodwin, the 22-year-old sophomore left wing from Des Peres, Missouri, scored his fourth goal of this season on a one-timer after taking a slick backhand feed from the influential Holstrom, who leads the Nittany Lions this fall with both ten assists and thirteen points. Penn State right wing Casey Bailey (25), who now counts 29 goals in 68 NCAA career games for the Nittany Lions, collides with UMass/Lowell River Hawks defenseman Dylan Zink, the 22-year-old sophomore from Madison, Wisconsin, in front of the net during the NCAA non-conference clash in New England. Penn State Canadian legionnaire DYLAN RICHARD (12), the freshman center from Sherwood Park, Alberta, who has appeared in eight of his team’s first nine games this season while scoring one goal so far, is chased by UMass – Lowell right wing ADAM CHAPIE (13), the sophomore from Oxford, Michigan, who found the back of the net in both of the Red Hawks’ weekend matches with the hosting Nittany Lions, during the NCAA non-conference meeting at the sold-out Pegula Ice Arena in State College, Pennsylvania. Skating like a team determined to complete the sweep and prove themselves to be better than their actual record this season shows, the visitors struck for three goals in the first period and then focused on disciplined defense the rest of the way as # 16 / # 13 UNIVERSITY OF MASSACUSETTS – LOWELL held off late charging PENN STATE 3-2 in an NCAA non-conference meeting. The victory capped off a very successful week for the traveling River Hawks, the NCAA Frozen Four participant last season who began their week with a triumph on the road at Ivy League adversary Princeton University in New Jersey before crossing the Pennsylvania border to contest a pair of matches at the Pegula Ice Arena in State College. After falling behind less than four and a half into the contest, the Nittany Lions did manage to haul themselves level a little more than halfway through the first period — but not without a bit of luck. A most fortunate shot from just above the faceoff circle by Canadian legionnaire LUKE JUHA, the sophomore from Mississauga, Ontario, who leads all Penn State defensemen in scoring this season (9 ga, 3 go, 6 pts) was deflected wide of the net by a UMass-Lowell defender but the puck conspired to ricochet off the back of the boards as well as a pair of players on the other side of the River Hawks’ cage. 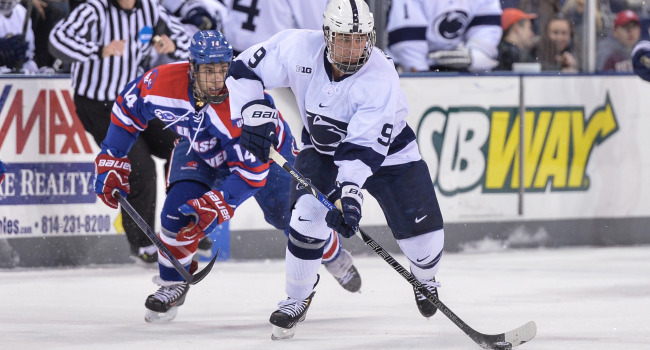 The tally was officially credited to Nittany Lions left wing ERIC SCHEID and finally snapped a nasty goalless drought that had lasted 124 minutes and 37 seconds, as well. Penn State left wing ERIC SCHEID (19), the redshirt sophomore from Blaine, Minnesota, who registered six goals in 30 NCAA games as a freshman for the University of Alaska – Alaska before transferring out, lifts his left Wayne Gretzky-style to celebrate his team-leading fourth goal of this 2013/14 NCAA campaign against visiting UMass-Lowell at the sold-out Pegula Ice Arena. UMass-Lowell stamped its authority on this particular contest by scoring a pair of goals in the second half of the first period. STEPHEN BUCO, the junior center from Providence, Rhode Island, who missed much of last season thru injury, restored the River Hawks’ advantage relatively quickly with a smart play to bank the puck off the back of Penn State’s freshman goaltender EAMON MCADAM while stationed behind the Nittany Lions’ net. River Hawks right wing ADAM CHAPIE later doubled the margin for UMass-Lowell after controlling a rebound and catching the inexperienced McAdam out of position rather easily roughly two minutes before the first intermission arrived. At this point, it rightly seemed as if UMass-Lowell (8-4-0) might just really run struggling Penn State (3-5-1) right out of its very own rink. But the entire Nittany Lions team (including the rookie netminder McAdam) did a magnificent job to compose itself after falling behind in the first period. Over the final forty minutes, head coach GUY GADOWSKY’s troops were able to display the kind of organized, disciplined and competitive ice hockey that the intelligent Penn State fan base correctly knows its team to be capable of. Fortified by 31 saves from McAdam, the homegrown native of Perkasie who was picked in third round (# 70 overall) of the 2013 National Hockey League Draft by the New York Islanders, in the last two periods, the Nittany Lions were eventually able to launch a legitimate comeback bid in the final frame. Penn State left wing DAVID GOODWIN intercepted a very careless UMass-Lowell pass in the offensive zone with just under eight minutes remaining and made no mistake in beating River Hawks goaltender DOUGLAS CARR from prime scoring territory in the slot. The late-charging Nittany Lions had several good chances in the closing stages and were able to exchange their shot-stopper McAdam for an extra attacker in the end but to no avail — full marks to the experienced UMass-Lowell side for effectively holding off Penn State while securing the positive result. Penn State left wing DAVID GOODWIN (9), the surprising freshman from Des Peres, Missouri, who is tied for the Nittany Lions’ team lead in scoring this season (8 ga, 3 go, 6 pts), is trailed by UMass-Lowell left wing JOSEPH PENDENZA (14), the homegrown senior from Wilmington who tied with teammate Scott Wilson for the River Hawks’ scoring leadership last season with 38 points (41 games), during the NCAA non-conference affair at the sold-out Pegula Ice Arena in State College, Pennsylvania. Penn State defenseman DAVID THOMPSON (22), the homegrown freshman from Glen Mills who has established himself as a regular in the line-up while emerging as the Nittany Lions’ leader with a + 3 plus/minus rating through the team’s first eight games of this season, tangles with UMass – Lowell’s Canadian legionnaire SCOTT WILSON (23), the junior left wing who was selected by the Pittsburgh Penguins in the seventh round (# 209 overall) of the 2011 National Hockey League Draft, along the boards during the NCAA non-conference clash at the Pegula Ice Arena in State College. An early strike less than two minutes into the game and another pair of goals scored exactly two minutes apart in the first part of the second period provided the visitors with more than enough firepower on this historic night in State College as # 16 / # 13 UNIVERSITY of MASSACHUSETTS – LOWELL blanked punchless PENN STATE 4-0 in an NCAA non-conference meeting. An NCAA Frozen Four participant last season and the first nationally ranked team to ever appear at the Pegula Ice Arena, it was, perhaps, fitting that it the River Hawks scored on their first official shot on goal just 1:51 into the game. Penn State were caught flat-footed by a lightning counterattack that concluded when ADAM CHAPIE, the sophomore left wing from Oxford, Michigan, who netted six goals in 35 games for UMass-Lowell as a collegiate rookie last season, netted his fifth goal already this term after taking a pass from center STEVE BUCO. It was, indeed, the fastest goal that had ever been scored to begin a game at the Nittany Lions’ brand new ice hockey facility. Penn State pulled itself together quickly and adjourned to the locker room for the first intermission still only trailing 1-0 but UMass-Lowell soon stamped its authority on the contest not so long after the second period started. Although Penn State goaltender MATTHEW SKOFF had been able to make initial saves, both Canadian legionnaire SCOTT WILSON, the River Hawks’ joint top scorer last season (41 ga, 16 go, 38 pts), as well as DEREK ARNOLD were able to find the back of the net with rebound shots exactly two minutes apart in the first half of the middle frame. For a traditionally low-scoring team such as the Nittany Lions, this particularly scoreline would prove to be insurmountable. With head coach NORM BAZIN’s boys comfortably enjoying a 3-0 advantage in its second road game in three days, it should come as no great surprise that the traveling River Hawks tried to protect what had already been gained. Thus, the never-say-die Nittany Lions were able to generate a good amount of pressure and totaled 28 shots-on-goal in the last two periods, alone. 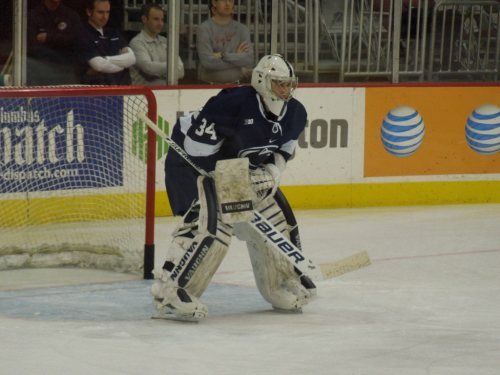 However, visiting goaltender CONNOR HELLEBUYCK was in fine form for the defending Hockey East champions and, so, Penn State were destined to be shutout for the first time all season. The Nittany Lions, to review, were blanked a total of four times in 27 NCAA varsity games last term. All four of these Penn State losses (to Division III Buffalo State, Robert Morris, Union College and Wisconsin) had been away from home, though. Therefore, the 37-save performance in State College from the UMass-Lowell netminder Hellebuyck went into the record books at the very first shutout in the short history of the Pegula Ice Arena. Arnold, the homegrown senior right wing from Norwood who was the River Hawks’ third leading scorer (41 ga, 13 go, 30 pts) last season, knocked home another rebound to score his second goal of the evening very late to set the final numbers. Wilson, the NHL prospect whose rights are held by the Pittsburgh Penguins, finished with a goal and an assist for the visitors. Buco, the junior from Providence, Rhode Island, and JOE GAMBARDELLA, the freshman center from Staten Island, New York, both registered two assists in the game for UMass-Lowell, who improved their mark this term to seven wins against four losses. UMass – Lowell goaltender CONNOR HELLEBUYCK (37), the sophomore from Commerce, Michigan, who was honored as the Hockey East Goaltender of the Year as well as the Hockey East Tournament Most Valuable Player as a collegiate rookie last season, seeks to smother the puck as an ambitious Penn State captain TOMMY OLCZYK (14) applies pressure at the Pegula Ice Arena in State College. 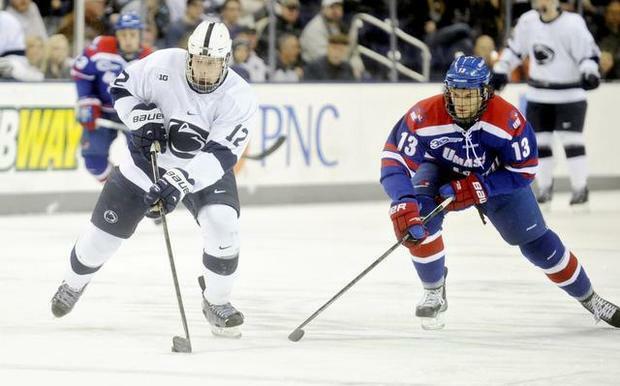 The UNIVERSITY of MASSACHUSETTS – LOWELL will skate in State College for the first time ever while facing off against PENN STATE as the brand new PEGULA ICE ARENA hosts the very first Thursday night game in the facility’s very short-lived history. UMASS – LOWELL (6-4-0), who are currently ranked # 16 in the USCHO.com poll and # 13 in the USA Today/USA Hockey survey, will arrive in Happy Valley having just defeated Ivy League hosts Princeton University 2-1 in New Jersey on Tuesday. The River Hawks actually entered this 2013/14 NCAA campaign ranked number one in the entire nation after reaching the Frozen Four for the first time in school history last term but were upset 2-1 in their very first game of this new season by lowly Sacred Heart University, a program that posted a record of two wins against 30 losses with four ties a year ago. The reigning Hockey East champions, who concluded the 2012/13 campaign with a mark of 28 wins against 11 losses with two ties, have already contested a pair of matches with Big Ten opponents and celebrated victories on the road at Michigan State (4-1) as well as Michigan (2-1) earlier this season. UMass – Lowell does return almost all of its key players from last season’s squad but did lose joint top goal-scorer RILEY WETMORE (now skating in the American Hockey League with the Bridgeport Sound Tigers) as well as CHAD RUHWEDEL, the undrafted defenseman who skated seven games in the National Hockey League with the Buffalo Sabres at the conclusion of the college campaign last term and is now currently assigned to the Rochester Americans of the AHL. Canadian legionnaire SCOTT WILSON, the junior left wing from Oakville, Ontario, who was the seventh round selection (# 209 overall) of the Pittsburgh Penguins at the 2011 NHL Draft, is back as is center JOSEPH PENDENZA, the homegrown senior from Wilmington. 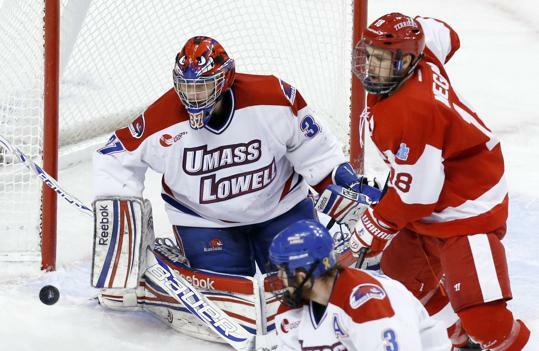 Both Wilson and Pendenza finished in a tie for the UMass – Lowell scoring leadership having totaled 38 points in 41 NCAA games last season while it was Wilson who ended up level on 16 goals with Wetmore. Also on hand once again is right wing DEREK ARNOLD, the homegrown senior from Norwood who wound up third on the scoring chart with 30 points for the River Hawks last term. One good indication of the depth that UMass – Lowell enjoy is evidenced the fact that Wilson, Pendenza and Arnold all skate on different lines. UMass – Lowell left wing SCOTT WILSON (23), the slender (6’0″ 172 lbs) seventh round NHL draft choice of the Pittsburgh Penguins who was honored as the Hockey East Rookie of the Year at the conclusion of the 2011/12 campaign, potted 16 goals in each of his first two collegiate seasons and currently boasts a career total of 33 goals from 88 NCAA games. CHRIS MANICCIA, the undrafted Canadian legionnaire from St. Catherines, Ontario, who scored his second goal of this season on the road at Princeton University on Tuesday night, is one newcomer for the River Hawks who has adjusted well to college hockey thus far while freshman center EVAN CAMPBELL, the Canadian import from Port Coquitlam, British Columbia, who was tabbed by the Edmonton Oilers in the fifth round (# 128 overall) of the 2013 NHL Draft this past summer, is pointless in six games for UMass – Lowell. The top two goaltenders for the River Hawks have both been receiving plenty of ice time from head coach NORM BRAZIN once again this season. CONNOR HELLEBUYCK, the pride of Commerce, Michigan, who was picked in the fifth round of the 2012 NHL Draft by the Winnipeg Jets and posted sensational numbers as a freshman (24 ga, 1.37 avg, .952 save pct) while backstopping UMass – Lowell to the Frozen Four, has slipped a bit in his first six starts as a sophomore but only just (2.21 avg, .925 save pct). DOUGLAS CARR, the homegrown product of Hanover who had seen his overall production decline as a junior (19 ga, 2.71 avg, .897 save pct), has been in very good form to begin his final collegiate campaign (4 ga, 1.98 avg, .925 save pct). Considering the fact that it was the senior Carr who appeared in the victory over Princeton on Tuesday, it is, therefore, most likely that the Nittany Lions will have to contend with the sophomore Hellebuyck when Penn State drop the puck with visiting UMass – Lowell at the Pegula Ice Arena on Thursday night. UMass – Lowell center MICHAEL FALLON (20), the 21-year-old freshman from Glenview, Illinois, and his opposite number from YALE UNIVERSITY, Pittsburgh native and 23-year-old junior center JESSE ROOT (20), follow the puck into the corner during the closely-contested 2013 NCAA men’s ice hockey tournament semifinal clash that required overtime to decide at the Consol Energy Center in Pittsburgh, Pennsylvania. A very well-taken, to speak nothing of well-deserved, goal seven minutes into overtime settled a match that was far more one-sided than the final score could ever begin to reflect as surging Ivy Leaguers YALE UNIVERSITY outlasted the reigning Hockey East champion as well as # 3 ranked UNIVERSITY of MASSACHUSETTS – LOWELL 3-2 and secured its berth in the Final of the annual NCAA men’s ice hockey tournament for the first time in the 65-year history of the excitement-filled competition. UMass – Lowell, the first-time conference champion who never before had advanced to the Frozen Four on three prior appearances at the NCAA’s prestigious post-season tourney, were in the midst of its most successful campaign ever having already won a school record 28 games this season. 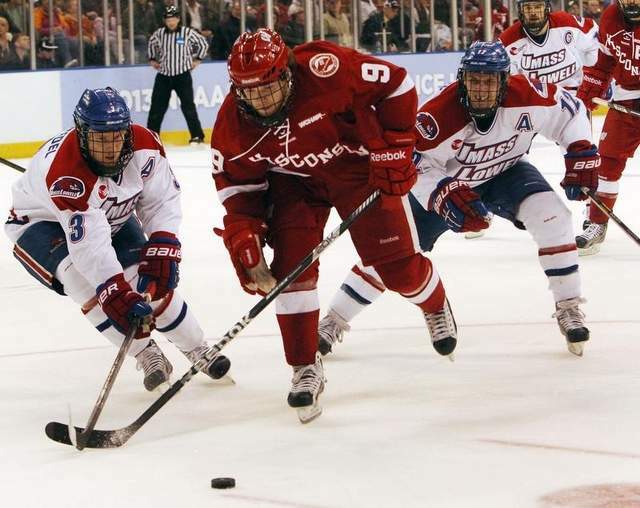 The River Hawks had been enjoying a good run of form as evidenced by the 6-1 wipe out of six-time NCAA champion Wisconsin and the 2-0 shutout of host New Hampshire in the Northeast Regional bracket. Facing off against pesky Yale in Pittsburgh, in fact, UMass – Lowell had won seven on the trot and not lost since dropping a 3-0 decision to Providence College in early March. But the River Hawks, who had been seeking a fifth NCAA national championship title for a Hockey East school in the past six years, would be completely stifled at the semifinal stage of the NCAA tournament virtually the entire time by the relentless forechecking pressure of their Connecticut-based counterparts from the Eastern Collegiate Athletic Conference. UMass – Lowell consistently struggled to successfully move the puck out of its own end and had no answer whatsoever for the energy and work rate of the Bulldogs, who actually almost skated its way right out of this year’s Sweet 16 On Ice after turning in a dreadful performance at the final tournament of the ECAC post-season playoffs this spring. 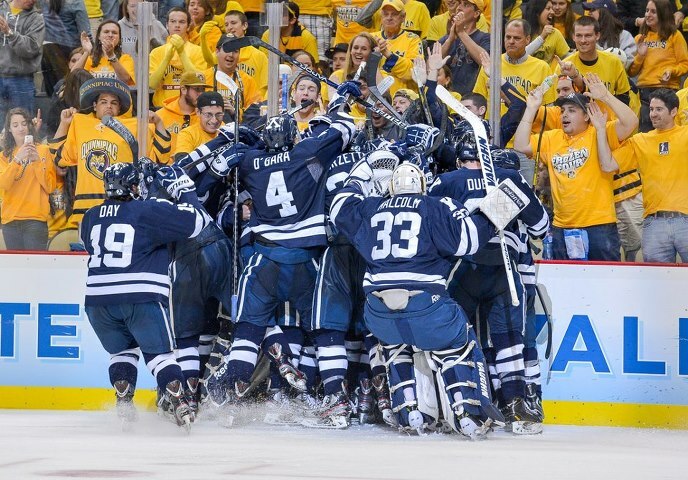 Having already upended both Minnesota and North Dakota, a pair of schools that have won a combined 12 NCAA national championship titles between them, however, Yale always looked like a very determined team skating against the River Hawks in the city where the Allegheny, Monongahela and Ohio water ways all converge. Yale University’s Canadian legionnaire ANTOINE LAGANIERE (28), the native of Quebec who netted 34 times in his last two seasons for the Ivy League champion Bulldogs, snaps the puck over UMass – Lowell netminder CONNOR HELLEBUYCK (31), the 19-year-old freshman who fashioned sensational numbers (24 ga, 1.37 avg, .952 save pct) this term, to score the second goal of this 2013 NCAA men’s ice hockey tournament semifinal match at the Consol Energy Center in Pittsburgh, Pennsylvania. Indeed, Yale capitalized on its very first power play opportunity of the semifinal after UMass – Lowell left wing SHAYNE THOMPSON was banished to the penalty box for high-sticking almost eleven minutes into the opening period. Bulldogs defenseman MITCH WITEK, the 20-year-old freshman from Downers Grove, Illinois, who was playing in just his twenty-first collegiate contest this term, picked an outstanding moment to register his very first career goal for the Yale University varsity with a long shot from the right point that was screened. Yale doubled the margin with less than a minute remaining in the first period when Canadian legionnaire ANTOINE LAGANIERE, the senior right wing from L’Ile-Cadieux, Quebec, who was destined to sign a free agent contract with the Anaheim Ducks of the National Hockey League, garnered a rebound in the slot and quickly flicked the puck over beleaguered River Hawks netminder CONNOR HELLEBUYCK to score the 15th goal of his senior season. The Bulldogs continued to swarm all over the ice in the middle period but UMass – Lowell, to its tremendous credit, hauled themselves level with a deadly two-goal spurt in the second half of the second frame at the Consol Energy Center. 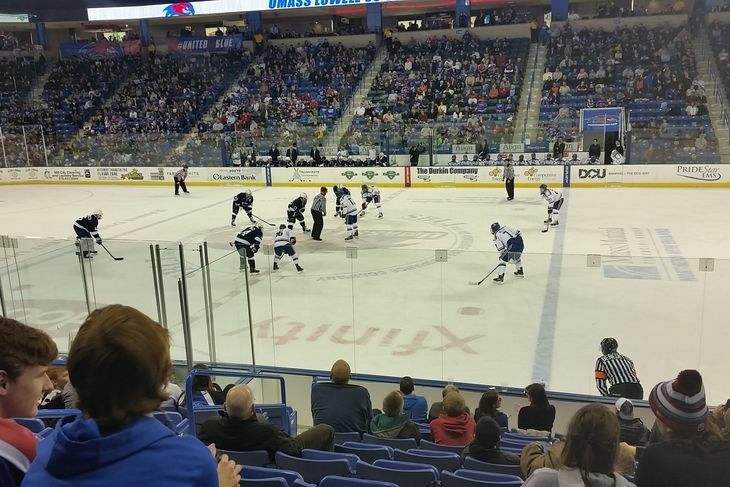 River Hawks right wing DEREK ARNOLD, the homegrown junior from Foxboro who scored the only goal of the game in the 2013 Hockey East Final against Boston University, took a long, hopeful shot from the point that was redirected onto the stick of center RILEY WETMORE in front. The undrafted senior from Swanton, Vermont, who would soon join the Bridgeport Sound Tigers in the American Hockey League, easily beat Yale shot-stopper JEFF MALCOLM on the backhand to become UMass – Lowell’s joint top goal-scorer this season with 16 strikes at the 14:38 mark of the second period. Just 14 seconds later, JOSEPH PENDENZA, the homegrown junior center from Wilmington who finished as the River Hawks’ second-leading scorer with 38 points this season, took a nifty, no-look behind-the-back pass from freshman A.J. WHITE and whipped a wrist shot past Malcolm from right faceoff circle. Beginning with the very moment the puck was dropped to begin play in the third period, the game-winning goal always seemed to be only a matter of time for dominant Yale University, who outgunned UMass – Lowell by a decisive 40-18 margin in the sixty minutes of regulation play and took all seven shots in the overtime period, as well. Hellebuyck, the 19-year-old freshman from Commerce, Michigan, who was the fifth round choice (# 130 overall) of the Winnipeg Jets at the 2012 NHL Draft last summer and honored as Hockey East Goaltender of the Year for the 2012/13 season, did all he could to hold the River Hawks in the NCAA semifinal at the Consol Energy Center. A hesitant moment of indecision at the blue line would prove to be lethal to UMass – Lowell, however. 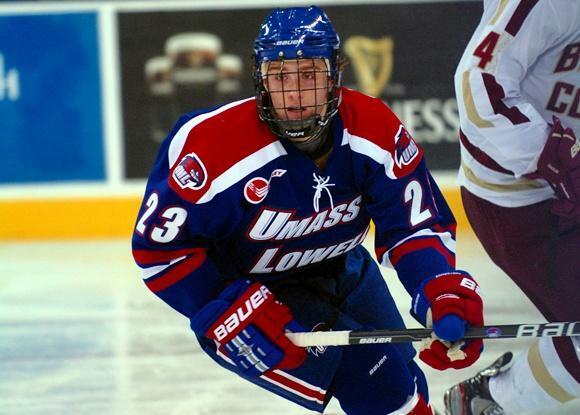 River Hawks defenseman GREG AMLONG, the 21-year-old freshman from O’Fallon, Missouri, who appeared in just 23 of UMass – Lowell’s 41 NCAA contests this season, might have been more aggressive about challenging Yale captain ANDREW MILLER for a loose puck and, instead, offered only a meek poke check while skating backwards. The Bulldogs’ senior right wing from Bloomfield Hills, Michigan, easily won the duel with Amlong and blew right around the River Hawks’ rookie blueliner. A clever backhand from Miller right through the five-hole sent Yale to the NCAA Final for the very first time in the long and storied history of Bulldogs ice hockey. UMass – Lowell left wing RYAN MCGRATH (10), the 21-year-old freshman from O’Fallon, Missouri, who arrived in New England after skating two seasons for the Cedar Rapids RoughRiders in the United States Hockey League, and Yale’s senior Canadian netminder JEFF MALCOLM (33) focuses on the puck during the semifinal contest of the 2013 NCAA men’s ice hockey tournament witnessed by the crowd of 17,428 spectators at the Consol Energy Center. Note — Canadian legionnaire CARSON COOPER, the freshman center from Bow Island, Alberta, had collected just one goal and three assists after skating in all of Yale’s first 35 contests this season prior to the 2013 NCAA semifinal match with UMass – Lowell … it was, of course, the Bulldogs rookie pivot who made a safe and solid play to bank the puck off the boards in center ice and provide senior captain ANDREW MILLER the chance to record what head coach KEITH ALLAIN, himself a former goaltender for Yale University in New Haven, has rightly designated as the single most important goal in the Ivy League school’s history. UMass – Lowell’s influential netminder CONNOR HELLEBUYCK (37) and Boston University left wing WADE MEGAN (18), the senior from Canton, New York, who was the fifth round choice (# 138 overall) of the Florida Panthers at the 2009 National Hockey League Draft and finished tied for second on the Terriers with 16 goals scored this season, both eye the loose puck during the very closely-contested Hockey East Final at the new Garden in Beantown. In what developed into a duel of two freshmen goaltenders whose names were called at the annual National Hockey League Draft last summer, it was only a fortuitous wrap-around goal midway through the final period which separated the two teams as the # 6 ranked UNIVERSITY OF MASSACHUSETTS – LOWELL held off proud BOSTON UNIVERSITY 1-0 to claim the very first Hockey East tournament title in school history. UMass – Lowell won three national championships (1979, 1981 and 1982) at the NCAA Division III level before moving up to the top flight to start the 1983/84 campaign. The Red Hawks, who improved their record for this banner 2012/13 season to 26 wins against 10 losses with two ties after the narrow win over B.U. at the new Garden, appeared at the annual NCAA tournament for only the fourth time in school history last spring. Head coach NORM BAZIN’s club did finish first in the Hockey East standings during the regular season that just ended but victory in this year’s tournament final in Boston must still stand as the all-time high water mark for the UMass – Lowell program, however. Five-time NCAA champion Boston University were hoping to win a 12th Hockey East tournament title and prolong the career of JACK PARKER, the highly respected and extremely successful head coach who is retiring after 40 years in charge of the Terriers, but it was not to be. UMass – Lowell right wing DEREK ARNOLD (29), the homegrown junior from Foxboro who is the third leading scorer for the Red Hawks having registered 28 points in 38 games this season, lifts the puck over the desperate Boston University pair of sprawling defenseman RYAN RUIKKA (2) and netminder SEAN MAGUIRE to score the only goal of the 2013 Hockey East Final watched by the crowd of 13,778 spectators at the new Garden in Beantown. 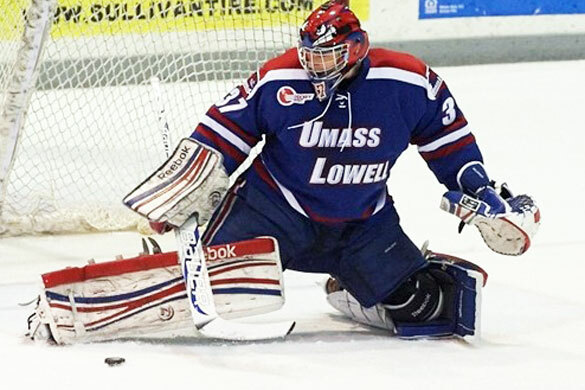 UMass – Lowell goaltender CONNOR HELLEBUYCK, the freshman from Commerce, Michigan, who was chosen by the Winnipeg Jets in the fifth round (# 130 overall) at the 2012 NHL Draft last summer, dealt with all 36 Boston University shots and became only the fourth netminder to turn in a clean sheet in the history of the Hockey East Final. Hellebuyck had also made 34 saves in the tight 2-1 triumph over Providence College at the semifinal stage a day earlier and was, accordingly, voted onto the Hockey East tournament All-Star squad. UMass – Lowell defenseman CHAD RUHWEDEL, the undrafted junior from San Diego, California, and Canadian legionnaire SCOTT WILSON, the sophomore from Oakville, Ontario, who was picked in the seventh round (# 209 overall) of the 2011 NHL Draft by the Pittsburgh Penguins, were singled out for all-tournament honors, as well. Boston University’s Canadian legionnaire SEAN MAGUIRE, the freshman from Powell River, British Columbia, who was selected by the Pittsburgh Penguins in the fourth round (# 113 overall) of the 2012 NHL Draft eight months ago, also had a solid outing between the pipes for the Terriers and totaled twenty-eight saves, it should be noted. Two Boston University freshman, center DANNY O’REGAN and defenseman MATT GRZELCYK, ended up on the 2013 Hockey East tournament All-Star team after also being named to the conference’s All-Rookie squad a day before the semifinals at the Garden. The prolific O’Regan, who was tabbed in the fifth round (# 138 overall) of the 2012 NHL Draft last summer by the San Jose Sharks, became the first freshman to lead the Terriers in scoring since future NHL star Tony Amonte accomplished the feat at B.U. during the 1989/90 season. Grzelcyk, the third round choice (# 85 overall) of the Boston Bruins at the 2012 NHL Draft, led all Boston University blueliners with 23 points (three goals) this term. Boston University’s Canadian legionnaire EVAN RODRIGUES, the undrafted sophomore right wing from Etobicoke, Ontario, who, like O’Regan, scored two goals in the semifinal defeat of Boston College, rounded out the Hockey East tournament All-Star team this year. NOTE — the 2013 Hockey East champions feature two players from the greater Philadelphia area in defenseman JOE HOUCK (Richboro), the junior transfer from Division III school Hamilton College who recorded 10 assists in 33 games for the Red Hawks this season, as well as right wing TERRANCE WALLIN, the sophomore from Langhorne who saw his production for UMass – Lowell radically decline from eight goals and 25 points in 38 games a year ago to just two goals and seven points in 34 games this term.